This article lists common usability web design mistakes that many website designers tend to make. Web usability refers to the ease of use when trying to accomplish a task at a website. These are not in any specific order. Each of them contributes about an equal amount of inconveniences to a web site so it is hard to order them. Now try doing a Save Target As on the above link. You get the Save As dialog. There's also the added advantage of the search engine being able to index the linked page. Face it, we all make spelling mistakes sometimes when we type. Normally we leave that burden to Microsoft Word Spell Checker. But, the web editor you use may not be as feature rich as Microsoft Word. It may catch spelling errors but not grammatical ones. See an example of the problem. Scan the document through Microsoft Word by opening a copy of it as it tends to change the HTML code unnecessarily. Yes, that means you have to copy every change manually to your web editor. Bad for Search Engine Optimization (SEO) - This is especially for sites that are fully based on Flash, search engines will have trouble indexing them with the exception of Google - which does its best to index but always turns out much worse than a non-Flash site. Big download = Long Wait - If you are using a Flash movie as a splash image, place a "Skip Introduction" link outside the Flash in HTML code, not in the movie itself, as it will bar users without Flash from entering. For sites fully based on flash, visitors will need to wait more time to see something on your site. Mobile Compatibility - There is a ultra high probability that PDA devices and mobile phones will either have trouble viewing or even loading the flash elements of the site. Heck, even an Apple iPhone 3GS or iPad can't view such sites. Totally New Interface - For full Flash based sites, it breaks the standard interface of the browser such as the Back, Forward, Refresh buttons and inability to interact with the page like a normal HTML page (e.g. cut, copy, paste, copy link shortcut, right-click options). Users will have trouble bookmarking a particular page of the flash. Some developers have worked around this by creating anchor links for every link clicked on the flash movie but many other usability problems still remain. Flash sites look awesome, but as you can see, there is a high price to pay for it. If you have to develop a Flash site, cater a HTML version for Flash impaired visitors. And don't forget, place the link to the HTML version outside the flash movie. A website fully based on Flash. A big no-no. As the main navigation bar in every page. This will prevent users who don't have the Flash plug-in unable to navigate to any of your pages). Search engines would also not be able to index your site properly as they are unable to 'see' any links on the page. As an animated logo in every page. See Animation (Including Flash). A common mistake many new designers make is placing a 800 x 600 image in a webpage resized to 32 x 32 manually (i.e. setting the width and height attributes to a much smaller number). By doing this, the user has to download the whole 800 x 600 image, just to view the 32 x 32 image fully. There are free programs, such as Easy Thumbnails, IrfanView, Picasa and GIMP that allows you to save a smaller version of the image. Use the smaller image to link to the bigger one and you cut down the time the user has to wait for your page to load. Animations serve to distract. That is why advertisement banners are animated (or even in Flash animation). For example, falling snow flakes are better used for one short page (preferably only during a special occasion) rather than on every page. Likewise for page transitions - limit to one page. It goes without saying that animated GIFs should never be used as backgrounds. Animations are good when used as a user expects - introduction movie, a Flash movie, an animated diagram, advertisements or greeting cards. Now, wasn't reading this text hard with the animation on the right? Click the Stop (thanks IE!) button if it is annoying in this as well as in other pages. Unfortunately, it does not work for Flash and other types of non-GIF animations. Here we are enjoying The Reason by Hoobastank and suddenly a Mortal Kombat music fires on entering a page drowning the song. Thankfully, IE allows users to stop the music by hitting the Stop button. The worst case is having a MIDI file on every page. Don't put music files to run in the background on a web page, unless it is specifically requested by the user (eg. he intentionally clicked on a link to sample the music). If you must use a MIDI music on a website, put the code on a frame (like a navigation frame bar) and allow the user to stop it by providing player controls. This way, the music continuously plays throughout the visit (instead of changing for every page) and the user has a choice of stopping it. User starts reading article. Reaches end of page. Which is faster and saves more time? The main reason behind splitting articles is because banner ads could only be shown once on every page. Having multiple pages, would mean that the user would see more ads. And the feeling that long pages discourages the user - It does - but not for articles. Users expect articles to be long, but not simple product or home pages. Put the whole article on one page. Avoid any kind of "Image Slide Shows" in HTML - it is a variant of paging too. If you must split into many pages, consider implementing a Printable Version (with the ads removed) so that users who want to print your article don't have to print one page at one time. Similar to above, this "technique" is used by many designers. Each FAQ question's answer is a link that points to another page. To read the entire FAQ, the user has to perform a click on each link, read the text and a back button click for each FAQ. For an entire FAQ of about 10 questions, that relates to 20 clicks. What about the time spent to wait for each page to load? Don't make answers to appear only when the question is clicked on. If you want to do this, put a "Expand All" link that allows all answers to be shown. Imagine how hard it is to read with one long paragraph of text especially with a textured background as compared to a background of solid color. Ensure your text is readable without the users having to strain their eyes. There's nothing worse than to get a dark gray text on a black background when a user surfs with images disabled. The text on the right may be easy to read on a small scale, but on one whole page, it'll cause the user to hit the Close button. Thankfully, modern browsers allow you to hit Ctrl+A (Select all) to make the text more readable. Choose colors that give a good contrast balance to the text and background. Avoid textured backgrounds that contain a mix of bright and dark colors. If you are having trouble thinking of colors, check out this Colour Scheme Generator. Design your site for the minimum - 800 x 600. Designing higher than that produces a horizontal scroll bar for users using 800 x 600 display resolution. Users don't like scrolling horizontally when on a website. Although the vast majority (as of 1st Jan 2006) of users use 1024 x 768, there is still a significant number using 800 x 600, probably with old computers or resized windows. There are also some people who prefer to open websites at 800 x 600 in their high resolution display, browsing two sites side-by-side at a time. Follow a liquid design (also known as fluid design) of layout. The basic principle of achieving this is by using percentage values for table widths. This allows the text to fill in the entire available space in the browser - like Bootstrike.Com does. Some designers prefer to use DIVs rather than tables, but ultimately, the end presentation should be user friendly. If you need to have a fixed width design, consider having different versions for an 800 x 600 and 1024 x 768 users. Use a common font in your pages. If the user does not have the font, the browser will render the page using its default fonts and would not be what the designer intended it to be. This is an important aspect of readability in web design. Please, don't use Times New Roman. This font is more appropriate for print documents, which is why if you have a "Printable Version" of a document, it should use this font mainly. Use common fonts from this list of core fonts in Wikipedia. Most sites use Arial. You can also specify multiple fonts instead of one single font. For web usage, it is recommended to use "Arial, Helvetica, sans-serif" so that the browser will use Helvetica if the user doesn't have the Arial font. Likewise, for print layouts, it is recommended to use "Georgia, Times New Roman, serif". Small fonts are great for small snippets of text like copyright notices. But for long articles, the user gets tired of the small font and gives up eventually. Most users do not use the Text Resize feature of the browser. In fact, the feature doesn't even work with some websites. It is becoming a "cool" factor for websites to use small microscopic fonts like the one on the right. Plainly put, it is fine for short snippets of text. Use it on a long article like this, and the user gets frustrated. Try reading this article with a smaller font size (View > Text Size > Smaller). Internet Explorer has a feature (or bug?) preventing font size changes (via Edit > Text Size) when websites use pixel (px) units to specify the font size. Keep in mind that a large percentage of users still use IE (with Firefox and Opera gaining on). Try to keep font sizes above 0.8em. Use font size units like EM and % to specify font sizes in CSS style sheets. Users are then able to use the Text Size functionality to modify font sizes as desired. Use a standard layout on every page. This means keeping the navigation bar, colors, fonts, link styles and other web elements consistent in every page. Every page should have an effective website navigation bar, either on the top or on the left. Don't place the main navigation on the right - users are accustomed to left or top navigation links. If you must place links on both sides, try to keep the left/top area for the main links. Place the logo near to the top left which should always link to the home page. Use Favicons to add an icon to your site for better branding. Internet Explorer and Firefox now automatically show your Favicon at the address bar and Favorites if the user adds your site to their Favorites. The top right can also be used to place a search box. Highlight the current active page in the navigation whenever possible so that the user is aware of where he is currently at. At Bootstrike, we show this as "Home > Articles > Top 34 Web Design Mistakes" above. Optimize your site images so that they load as fast as possible on the user's monitor. There are tons of software which do this for you, free ones included. Free popular ones include IrfanView and Picasa. A more advanced one is GIMP. For example, JPG photo files can be reduced in file size with only minor sacrifices in quality. GIF files also have a Loss and Number of Colors property that can reduce file sizes. Unless the photo is for users to save and print, don't place the original unaltered 4 (or more) megapixel photo on a page. Resize it to a comfortable size (eg: 800 x 600) which in turn reduces the disk space and download time. Provide a direct link to the full megapixel resolution image if you believe the user may want to print the image. Many websites could have made it higher in their search engine ranking (SERP) if they had thought about replacing those "Untitled Document" titles (take a look) with more meaningful ones. Placing meta keyword and description tags also help search engines to index your site. Google has also begun to take advantage of the META DESCRIPTION tag. Sometimes it will display the content of this tag for the site description in the search results. Keep in mind though - there's a limit to how much text Google is willing to index for this tag so don't make it too long. You can view our article on Search Engine Optimization. Perform a search for "Untitled Document" in your whole website. Replace them with meaningful titles. To make your pages more search engine friendly, define the meta description and keywords tag in every page. If you think we are referring to the words describing each form input element, you are wrong. Try clicking on the word Male on Form A on the right. Now try doing the same in Form B. It is more beneficial when used in radio boxes and checkboxes, as the clicking area for them are much smaller than the other inputs. By attaching a text label to it, the user can also click on the text to select the radio button. In fact, this is how normal Windows GUI applications work. To attach the text "Male" to the radio button, we give an id to the form object and wrap the Male text with a label. Sometimes, forms can get very big. One option is to use tables and organize them neatly. The other is to use Fieldsets and Legends. Fieldsets draws a frame around the form objects. It allows you to specify a name for the frame by using the LEGEND tag. Provide the alternate (alt) text of an image whenever possible. You don't have to provide this for every single image such as your spacer and sliced images, only those meaningful ones. For the other images, just leave the alt attribute blank as the attribute is required to be specified. For example, if your navigation uses images, consider adding the textual description to each navigational image. The Home image would label Home, the Products as Products, etc. Similarly text links can also have the title attribute set to better describe the link. It helps the disabled and folks who disable images or use text browsers when surfing. This is also done for search engine optimization purposes, since they are unable to read images. This point was highlighted above, and is being said again on a more general context - Put a separate "Enter Site" link outside the Flash move/shockwave/applet application so that the user can enter the site without needing the plug in. This way, if the user has ActiveX/plug-ins disabled, he can still enter the site. Search engines can also better index your page as they will also be able to follow the link. Avoid splash pages with one "Enter Site" link at the center. If splash pages are needed, consider placing the main section links along with the splash image. It is good practice to put a link to a feedback e-mail form on every page of the site. Keep in mind that a majority of users use web-based email such as GMail, Hotmail, Yahoo and Lycos. Try clicking on the link below. To e-mail George, click here. An e-mail box opens up. For some users, the Internet Connection Wizard starts up. This is because they are using free web mail services and not a software mail application. To e-mail George, users would have to extract the mail address from the Outlook form, fire up their webmail website, compose a mail and paste your e-mail address there. Most users aren't familiar with this process hence it makes them confused and unable to e-mail you. Put a simple web form that submits to a server side script such as PHP/ASP, which e-mails the form directly to you instead of relying on the client's e-mail ability. Forms should submit to a server side script to process the mail. Scripting languages such as PHP/ CGI / JSP / ASP server side programming can be used to process the form input. Do not use forms that that uses the "mailto" syntax to send a mail. There are free scripts which can assist to send the form for you if your host does not allow programmable scripts or you are not familiar with the technical stuff. Most servers support spaces in filenames, but avoid doing so. Always use a lowercase filename and folder name without any special symbols (including spaces but not "_") in them. Windows based HTTP servers usually are not case sensitive but the more common and cheaper Unix servers are. If your server is hosted in a Unix server, avoid usage of capital letters in the file and folder names. This helps a user remember the page URL easier if he or she decides to return on a later time. This is a snippet of text. This is a snippet of text. This is a snippet of text. This is a snippet of text. This is a snippet of text. This is a snippet of text. This is a snippet of text. This is a snippet of text. This is a snippet of text. This is a snippet of text. This is a snippet of text. This is a snippet of text. This is a snippet of text. This is a snippet of text. This is a snippet of text. This is a snippet of text. Don't pile a block of text all in one big paragraph to create a wall of text. Try to shorten it to 3-6 lines per paragraph and users will have an easier time reading the content. Don't use the whole browser width for one line of text. Keep it to about 75-90% of the width of the screen, especially when page margins are set to zero. Such a method comes with its share of problems. By disabling right-click, you remove all the capabilities of the right-click menu - some of them do not have their own toolbar icon or menu item in the browser. A common piece of advice comes to mind here - If you want your html / images / text to be private, then don't put it online. Frames have generally been frowned upon by the web design community. Pages in frames don't get added to the users bookmarks properly, causing problems when the user tries to return to the site. When the user enters a framed page from a search engine, it causes a problem as the page would not have any navigation, which is located in another frame. Avoid frames. Do not use frames for your main navigation, even though it makes updating much easier. Consider using Server Side Includes (SHTML, SSI) or PHP includes. Do not use frames to add a little header on the top of every external website your site links to. However, if you must do this, ensure that a link is provided to remove the frame as users will not be able to bookmark the page easily. Link that changes only on mouse over. link with no reaction other than cursor. The WORST case. Use the underline function for links and links only. The current conception with many web designers is that underlines look ugly. Instead, many choose to provide a bold formatting with a different color to the links. Some websites even go to the extent of showing that a link is a link only when the mouse is hovered over the text and some formatting - like a underline, over line or a double underline - takes effect. This makes it very frustrating for users to recognize links, forcing them to hover the pointer on every word that could be a possible link. Don't use the "text-decoration: none" CSS tag for links. Change colors to fit the site theme, but leave the underline alone. Don't underline text which are not links. Use a special tag like Header 3 or Header 4 to place emphasis on it. Specify a different color for visited links so that a user is aware that he/she has already visited a link before clicking on a link. See Jakob Nielson's article on this. The purpose of Adobe's PDF and Microsoft's DOC formats are for viewing and printing documents with the intended paging and formatting. These are big size file formats, taking up much more disk space than a regular HTML file hence a user has to wait for a longer period of time for the document to load. The usual browser interface changes to the interface of the document owner's application (e.g. opening a DOC adds new menus and buttons to the IE window). Finally, the user has to wait till 100% of the document has been loaded before he can view anything. The newer PDF readers supports dynamic loading; it can render a document as it downloads. But the other usability problems still remain. Provide a HTML version of the document. Use PDF as an alternate download, indicating clearly that it is a non-html file. Most users would want quick access to the content of the document, and if they want a better version for printing, they will get the printable version. Don't open entire websites in a pop-up window. Websites are meant to be seen in the default browser window with all the status bars, title bars, toolbars and the other normal user customized add-ons. Some of the reasons cited by designers for this tactic are to prevent source viewing and to provide a full customized interface to the user, Both of these reasons are not valid - by right-clicking the page, or hitting Ctrl-N (thanks IE! ), a user can view your whole site source and images. Provide a customized interface? What about the normal browser buttons? Where do we enter a new URL to go to another site? If you are worrying that the user's browser may be too wide for your site, simply center the table design in the page. Do not use advertising companies which rely on pop-ups and pop-unders. They will chase away your visitors, and most of them don't work due to most browser's built in pop-up stoppers. Consider doing a liquid layout. AJAX is the latest cutting edge technology now to evade the web. Unfortunately, when a website uses it, it brings lot of inevitable changes to the way a user communicates with the website. 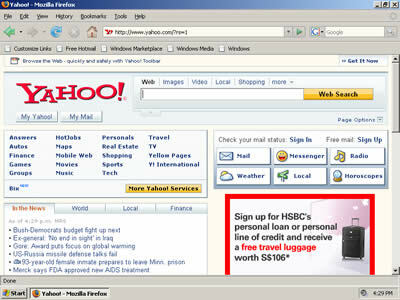 Check out GMail, which provides a AJAX powered web mail interface that works with the Back button. It even supports basic HTML mode! It is worth a note that the latest Internet Explorer 7 fixes that - placing the XMLHTTP object natively. If you want to use AJAX, be sure to provide an alternative non-XMLHttpRequest way to access your application. Till IE7/Firefox gets hold of the market, that is. 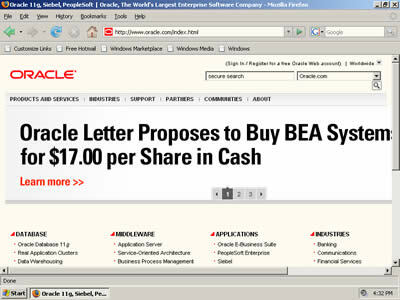 You can see how the artifacts in the Oracle logo are showing through. The fix for this problem is very simple - simply set a background color for every page in the BODY tag or style sheet. Does the design still hold even though the images are broken or disabled? Does the layout appear as intended in Firefox / Opera? Do all pages have consistent design and titles? Are all big blocks of text broken into small paragraphs? Is there a feedback link on every page? Search box on every page? Is the Flash Movie Skip link is outside the Flash movie? Many users of high resolution monitors force their browser to render text fonts at a larger size than the designer intended. They don't have much choice as LCDs demand that the highest resolution to be used for the best quality (called the 'native resolution') causing the fonts to appear smaller. This is made even worse by designers who commit Mistake #12: Small Font Sizes and Making Text Resizable. Adding more salt to the wound, some designers unknowingly design their site to 'hang' their browser when an accessibility feature is used. For example, if you try to visit the phpBB Community Forums with IE6 (with Text Size Largest, Ignore Font Sizes accessibility feature enabled), the browser hangs for no apparent reason. Notice how hard it is to read the overlapping capital letters. A good example of an accessibility friendly site would be BBC, which has spent a considerable amount of money on making its website very accessible. Try doing a Print Preview of this document. Really, just try it. You don't have to print it, just see a preview of it. Notice that the left column automatically disappears? In fact, with the left column removed, the page now has 20% more width (depending on your screen resolution, as the site is liquid designed). And that means less paper is needed for printing. How is this achieved? Via CSS! In summary, a separate style sheet is created that is used only when printing. Rather than go into specifics, take a look at some tutorials around. Search is one of the important navigators of the web. Almost all of us find websites through search engines such as Google and Yahoo! Did you know that almost any site can now offer a simple search solution without any scripting required? It is no other than Google's Custom Search Engine. Bootstrike's Search is also powered by Google. Place a basic search box in every page in a prominent location such as the top right. Presentation wise, this does not make a difference. But it can make a big difference to search engines, who are better able to analyze the layout of the page. For example, headings should use the H1 tag rather than the P tag. sub headings should use the H2 tag and so on. As stated, it does not make any difference in terms of usability and presentation. However, it can improve search engine rankings as well as provide accessibility-impaired users a more friendly page. If you have any feedback, please feel free to e-mail us . This document is Copyright(©) 2001-2010 by G.Ganesh. Visit Bootstrike.Com (http://bootstrike.com). Last Updated 29th August 2010.
enomsoft (1 posts) Nice article. Is Unregistered Hi, may I republish this article on my site with the backlink to your site as you're the original author? Admin Administrator hi, an excerpt with the link to this article is fine, but not the whole article. thank you. Jesse Unregistered It's been quite some time since the article was written. I think this would be added if it were re-written: layers popping up in the middle of a page when it loads that have to be "closed [X]" Also, Flash ads that make noise when your cursor goes over them, or Flash ads that cause layers to expand if you mouse over them. Music that starts playing automatically when a page is loaded (a la most myspace pages). Annoying! #5: The Esc key would stop GIF animations on most browsers. #23: Page source can also be accessed by going to "View > Source" or something similar to that on most browsers. #25: If no underline is applied to links, use a very distinct color not used elsewhere on the website. Make sure all links are underlined in printable versions. Header tags should not be used for emphasis, they should reflect a logical outline structure of a page. Use <strong> and/or <big> instead. Ancient Images Unregistered Say, didn't there used to be a hint about not using a "search web" option along with the "search this site" button? Joseph Unregistered Great article, but the links in the article aren't underlined and as you said, easy to miss. Mike Unregistered It looks like you forgot one other Web design mistake. The use of reverse text (white on black). Sure, headings are fine but a complete site, that's a no no in my book. Otherwise, you've complied a lot of very good info. Ancient Images Unregistered Great list!